Where Theranos and former CEO Elizabeth Holmes went wrong, these Stanford entrepreneurs are hoping to cover lost ground. Just one day before Theranos and Holmes were charged by the SEC with “massive fraud,” a demo day at Stanford revealed there is no shortage of interest in at-home healthcare solutions among Silicon Valley hopefuls. Theranos may been charged with ‘massive fraud’ by the SEC this week, all but ending what could have been a pioneering company. But the idea of simpler, better, more humane health technology remains alive and well. 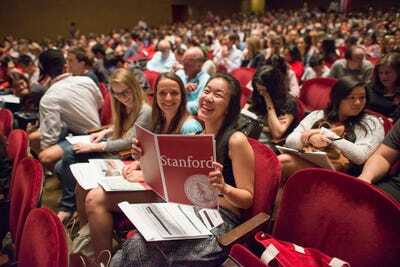 That’s judging from Tuesday’s Stanford University startup demo day, where current students at the university – and a handful of alumni – showed off to potential investors and the media what their very-early-stage companies have been working on. Notably, the event was one day before the SEC levied its charges at Theranos. 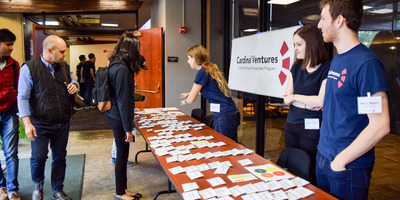 Cardinal VenturesCardinal Ventures student organisers pass out guest badges at last year’s demo day. Many of these young entrepreneurs pitched various gadgets and online tools that promised to bring procedures, tests diagnoses, and healthier habits straight into the customer’s home. The goal: winning the attention, mentorship and funding of several venture capitalists and angel investors in the audience. This trend toward personalised “wellness” products and services has been steadily growing, as previously noted by the Financial Times,Forbes, and others. And many of the founders at Tuesday’s event, organised by the university’s Cardinal Ventures startup accelerator program, are riding the healthcare wave. Several of the companies specifically described technology that will help patients shorten or avoid doctor visits by bringing medical procedures and testing into the comfort of their own home. Demetric Maxim, founder and CEO of Nephrogen Inc., says that Americans lose $US52 billion every year in “opportunity costs,” meaning potential earnings lost to wasted time, because of doctor visits solely dedicated to blood tests. On stage at the Stanford demo day, Maxim says that his company plans to combat this cost by developing a “rapid, cheap, at-home blood testing platform” that can examine blood samples in 30 minutes, for less than five dollars a test. CloudCathPart of the CloudCath sales pitch. Another startup, called CloudCath, also promised to minimise patients’ number of doctor visits by building a skin patch that monitors and protects incisions in the skin surrounding catheters and other medical tubing inserted into the body. “Complete visibility into compliance, treatment adequacy and early complication detection is now available at the comfort of patients’ homes,” according to CloudCath’s website. “By the time you get at CT scan, it is already too late,” said co-founder Damien Kettud in his pitch. The company aims to use genetic sequencing technology, similar to that developed by other consumer products like 23andMe, to detect and predict heart disease. Ultimately, it’s different ways of getting at the same idea: The idea that technology can improve the healthcare experience and make for a healthier world. It’s risky – as Theranos showed, healthcare is complicated, and it’s easier to have a great idea than it is to actually execute on it. But the promise is a healthier world.